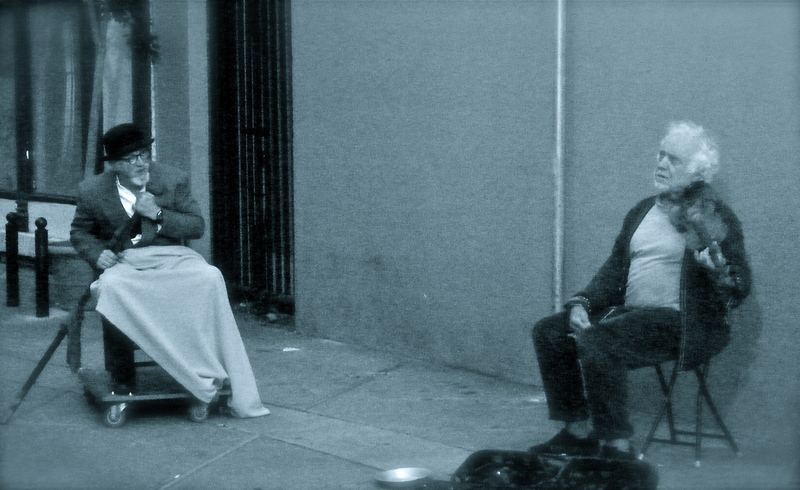 Two beautiful voices, echoing in the emptiness of the deserted streets in downtown San Francisco, drew us to an alley-way . . . Waiting for Godot? Waiting for time to pass . . . . Thank you so much Margie for the very warm welcome! Getting easier all the time but still I have to stop and think about what to cook each night for dinner, wherever I am. Hope you are having as good a day as your beautiful sunrise promises! Great photo you can see how the years have gone by. Thank you Green Eyes! I am sure they would be the first to admit how quickly the years have gone by. Yes! This is exactly the feeling of Waiting for Godot! I love it and I love the play, too… one of my all time favs. Andrea, Thank you so much for sharing your enjoyment! It was such a thrilling moment, but, even though they were “performing” (I say performing with reservation because there was no audience other than the occasional passer-by) in a public place I really did feel as though I had intruded upon their space and companionship. I also felt rather awkward taking the photograph. Their voices were truly beautiful, so rich and resonant. WOw this photo has what I like best – stories to tell! Thank you Gilly! It really was such a heartwarming experience. Beautiful photo! I’m waiting for the violin music to start when the conversation stops. Great entry. Theresa, thank you! The photo was snapped in such a hurry, they really did own the space! Patti, lovely photo, and the wheel chair. That chair really is something! So pleased you enjoyed the photo DP and always lovely to see you here, thank you! Jake, thank you so much! what a brilliant moment. the b&w (actually more like cyan tone) adds to the mood. Thank you Kris. I don’t have Photoshop but I do love the opportunity to turn colour into b&w, or as you so rightly say, the cyan tones. Out of curiosity, how many of your lovely shots do you print? Frizz, thank you so much! Great capture full of emotion an open to our thoughts as to what their thoughts are! The violin, the wheelchair, a tip plate? Had I had my wits about me I should have filmed them if only to catch the richness of their beautiful voices which were so vibrant and full of life. The energy of youth combined with experience! Extraordinary photo, looks like a still from an old French movie. Ah, beautiful New York. Love the photos. So calm and restful. Just relaxing to the sound, the vibe and the sunshine of the City. Late afternoon settings always bring a sense of comfort. It’s that part of the day that promises rest and rejuvenation. Happy Holidays my friend. Thank you IT. It is such a user-friendly city (I think so anyway) and because we all live in small spaces, on top of each other etc public space becomes part of the general living space, the outdoor porch or verandah. The park bench instead of the rocking chair! Enjoy all the excitement leading up to Christmas Day! For some reason, what I like most about this brilliant image is the distance and space between the two men; you have captured it exactly. It’s as if they are exactly and deliberately so; not too close, not too far. And you have also captured the connection between them. I’m not sure what the man on the left is holding, but it looks as if he is anchoring himself in the picture. The whole composition (although you took it quickly) is really very impressive. I like it very much. There was indeed geometry at play in the taking of this photo for exactly the points you make. The alley way was quite narrow and I was so anxious not to intrude as the third point in the triangle any further than I had already. It was such a pleasure to be there and your pleasure is extra company, thank you. Jo, thank you! San Francisco certainly does enjoy an atmosphere of its own. Thanks Martin! There is conjecture out there that Waiting for Godot is akin to watching paint dry, with dialogue . . . Thank you LFR, you would have loved their voices!